Ever have a Beatles kind of day? Earlier I was sad about something so I put on Let It Be. Then I felt better, so it was Here Comes the Sun. Then I got a migraine and took a lot of drugs and the song became Helter Skelter… OK, next I demand a nice happy three-chord song. How about I Wanna Hold Your Hand? I'm wearing one of Anya Ohmai's dresses, the simple onepiece. "Onepiece" is the Japanese term for dress…it's nicely descriptive. All in one, not a skirt and blouse. Also, I have Plurk again for those who feel like adding me back after my plurk-break! I'm here. Tomorrow (June 13th) begins the Etheria jewelry event. It starts at 4 SLT, and will showcase the likes of Lolapop (I'm wearing Lola's jewelry set here), Dark Mouse, Kess Kreations, Caroline's, and MONKEE. A number of clothiers will also be showing designs, beautiful gowns to accentuate the jewelry. I'm in Ingenue's gorgeous Valdez gown, here. Also featured will be Lark, Moonshine Designs, Blue Blood, and Evie's Closet. Tomorrow this SLURL will work after 4PM SLT: http://slurl.com/secondlife/Connection/107/105/238. For those of you who aren't yet following Hunain Bellic's blog, go see it here! He's making awesome posts, and his styling is adorable. This is Miss Radio Signals of Scribble. I took this photo on the sly, so please ignore that hat she's wearing, okay? It's a small sneaky preview of something awesome she'll release in a day or two in her shop. At any rate, she's adorable. 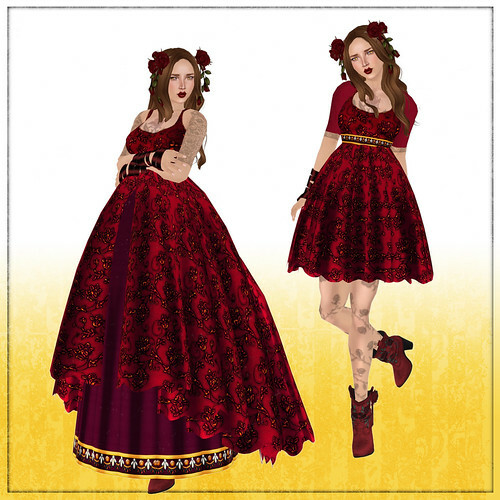 I gasped when I saw the pricetag (900L) on the new Silver Rose Designs Ekaterina dress. Then I realized that the dress earns every cent (and more) of the cost… There are 30 pieces in the outfit folder. It has so many options for sleeve, bodice, and skirt that it'll take your avatar to Gor, Caledon, The Deck, Hard Alley, and beyond… The workmanship isn't skimped either. I love the quality of the prims and fabric, and think that each style of dress works really well in itself. I haven't shown all of the options in these photos, either -- there are at least a few skirt styles that I didn't photo. This is a skin and tattoo review. I suppose. I'm honestly kind of over big skin reviews in which the reviewer posts picture after picture of themselves in someone's skin line… Yep, I used to do that all the time. Now I just think: damn, so that's how one particular avatar looks in all those skins. I love you all. I just don't find the reviews very useful, and would rather see how a blogger styles up one skin rather than, y'know, so many that the skins and makeups become a blur. Sileny Noel as Jem, totally.